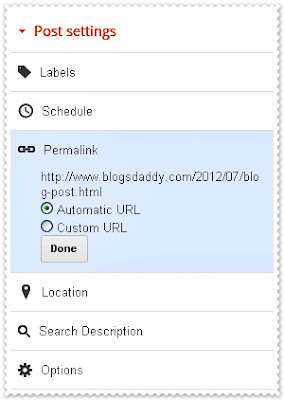 I was always searching for permalinks option for Blogger posts as like Wordpress. I found a awesome surprise when logging into Blogger to create a new post this morning: the ability to create custom permalinks for posts!. 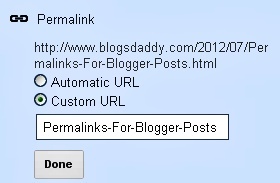 This tutorial will guide you "How To Create Custom Permalinks For Blogger Posts". A permalink (or permanent link) is a URL that points to a specific blog entry after it has passed from the front page to the archives.Blogger generates this permanent link according to your blogger post title (Keep In Mind:- If the title is in English). Usually when you create a post, the URL generated for the item page is based on the post title. By creating a custom URL we can use a different structure which can help posts rank higher positions in search engines. This has now changed and Blogger now allows you to decide what the permalink of your latest post should be. Note:- This feature is currently available in Blogger’s Draft Version. So if you would like to use it, just go to http://draft.blogger.com and create a new post. In the post options you will see a permalink option under post settings section. 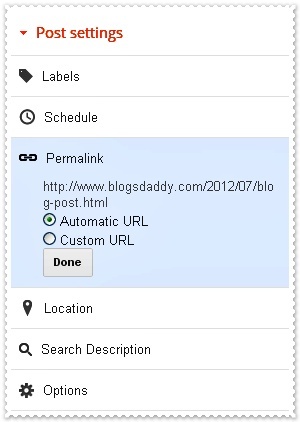 In the “Automatic URL” (the default option), Blogger will generate the permalink automatically. If you want to choose a custom URL, opt for the “Custom URL” option and you can write your custom post permalink over there. It will allow you to enter letters, hyphens and certain special characters [-_. ].Slashes are not acceptable. Always use combination of hyphens and alphabets to create new post permalink. Note :- This Blogger feature doesn’t allow you to modify the Permalinks of older posts but you can make use of this function on your new posts There seems to be no limit to the length of this Custom URL at the moment but Blogger might impose some length limit in future. This feature may not yet be available for all blogs, though I imagine the update will be rolled out for everyone in the coming days. Please let me know in the comments below if custom permalinks are available for your blogs, and whether you find this new feature useful!